Missä haluat rentoutua kauniissa lomakeskuksessa tai nauttia Orlandon heistä puistoista, työmatkalla kävelyetäisyydellä oranssin läänin kongressikeskuksesta. täällä on kaunis 4. kerros 2 makuuhuonetta / kaksi täyttä kylpyammeet nukkuu jopa 8 henkilöä / sijaitsee kauniilla Vista cay keinona paras romanttinen näkymä päivällä ja yöllä keinona tärkeimmät allas ja kaunis järvi ja päivittäinen palo työmuoto ne puistot. Yksikkö on erittäin puhdas ja täysin kalustettu kaikella mitä tarvitset erinomaisen loman tai työmatkasi. Great location. Great view. Would definitely rent again. The condo was great! Nice furnishings, fresh paint, great views. The only thing we didn’t like was having to use a 10-digit code on the front door. It was too long to memorize. Condo worked well for our purposes. Clean, ample supply of dishes, pots/pans, etc. Good location both within the Vista Cay complex (good view of pool/lake) and in Orlando generally. We were there to attend NCSA Jr. National swim meet and the location was excellent to get to the pool - less than 2 miles. Would definitely consider returning. If had one complaint it was that the 10-digit access code to enter the condo was cumbersome. Would much prefer just having key cards. Perfect spot & view. Great owner ! Great weeks stay & owner! Great place to stay and location was close to everything you need. Thank You for using my place for your stay and glad that you enjoyed your time. 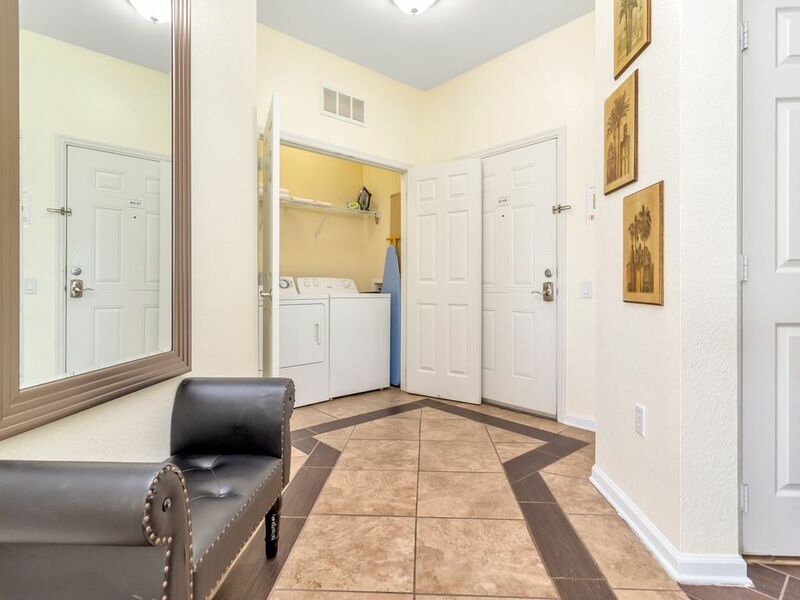 Great place, awesome location, close to Universal Studios, Sea World and Icon. Michael was very accommodating. He responded to our requests/questions right away. He will go above and beyond to make sure his guests are happy. It is in a gated community which I did not realize (felt better especially with a female teenager). I would definitely stay again. One thing I will note, I wish there was a kuerig (there is a regular coffee pot in the kitchen). But other than that, the pool is nice, condo was wonderful. I would highly recommend this place! We truly enjoyed our stay. Thanks Michael! I am so glad you enjoyed your time at my place and I agree its very safe resort and happy to know that you are coming back . I only have the regular coffee maker because that what most guests like ,however may be have both ?? which may be too much !!!! Vista Cay on kaunis lomakeskus sijaitsee vieressä Orange County convevntion keskus ja uusi nähtävyys Orlando silmä, kävelymatkan päässä International Drive, vain muutaman minuutin Universal alueella ja lähellä Disney ja Downtown Disney.